Media outlets were busy reporting last week that Activision raked in $500 million in its first day of sales for “Destiny,” becoming the biggest launch of a new video game franchise in history. With half a billion dollars sunk into the development and marketing of the game, Activision had a lot riding on the success of its first venture with Bungie, and in one day, the company recouped its investment. As within the movie industry, video game TV advertising plays a significant role in marketing leading up to the launch of a title. The campaign strategy from the teams behind Destiny’s marketing demonstrates a thoughtful and focused effort to speak directly to gamers. Launching a product through TV is not the same as sustaining a product through TV. The launch, particularly in video games (and movies), is often about establishing credibility among a category’s heavy consumers and influencers, and then generating excitement and awareness among the buying public. The two creative spots developed for Destiny’s launch and the media placement of each reveal a thorough understanding of this oft-used strategy. The first ad, “Launch Gameplay Trailer,” is all about credible communication that introduces both the experience of gameplay and the endorsement of gamers. The spot leaves no doubt about the brand behind the bold, next-gen title. Bungie, creator of Halo, gets top billing in the title sequence. Media quotes further enhance the authority of the ad. Variety, Forbes and USA Today all make appearances in the ad, and new-media influencers like The Escapist and Destructoid add peer endorsements to satiate hard-core gamers. Finally, the ad propels forward visually with gorgeous gameplay footage that illustrates the scope of adventure and severity of alien foes that await. All elements are aimed at a singular message to the gaming faithful: Destiny is a quality product, produced by a quality brand, to deliver a quality experience like no other. Creative production won’t hold if the media plan isn’t in sync with the campaign strategy, and Activision targeted this first ad to a relatively narrow segment of the game-playing audience. Media placement ensured the spot would be seen by the most ravenous of consumers – those eager early-adopters most likely to binge on the next great new game. Where a game like “Madden 15” was launched with advertising across a diverse set of shows with a more established audience, Destiny’s first TV ad bowed within The Simpsons marathon on FXX, and it mostly stayed there for much of the first five days. From August 21, 2014 thru August 25, 2014, “Launch Gameplay Trailer” aired 100 times for a total of more than 50 minutes of on-air time. 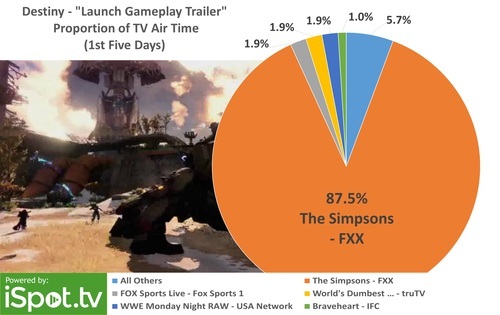 Astonishingly, 87 of those airings were on FXX during “The Simpsons.” Consider that targeted buying compared to Madden 15. 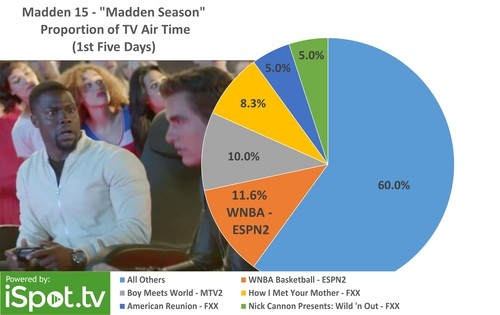 In its first five days of airing on national TV, “Madden Season” was on MTV2 38 percent of the time, FXX 28 percent, Cartoon Network 13 percent and ESPN2 12 percent. To have such singular placement of advertising around an ad that aired more than 100 times in only a five days reveals a concerted effort to reach a particular audience. That audience? Younger, male, cynical cartoon-comedy fans who are just as happy to sit on the couch and take in hours of a TV marathon as leave the house and go elsewhere for entertainment. “Become Legend,“ Activision’s second ad, is a different viewing experience than “Launch Gameplay Trailer.” “Become Legend” is a true cinematic experience, witnessed by its live acting, a deft directors touch, compliments of Joseph Kosinski, who helmed the movie, “Tron: Legacy” and creative influence from the brand’s agency, 72andSunny. The ad contains witty, wry banter, varied planetary settings, theater-quality special effects and a killer track, courtesy of Led Zeppelin’s “Immigrant Song” Again, a singular message, but this time to the broader game playing public; Destiny is an exciting, escapist adventure that, more than anything else, is fun to play. Where the media plan for the first ad targeted the message to a narrow segment, the plan for the second spot expanded its reach to broader audiences. “Become Legend” still appeared on networks and shows that gamers are most likely to watch, but the TV spend cast a wider net beyond only “The Simpsons” marathon on FXX. Instead of 87 percent of 100 airings on The Simpsons in the first five days, from September 4, 2014 through September 8, 2014; “Become Legend” aired 75 times with only 14 percent on FXX and five percent on “The Simpsons.” Comedy Central aired nearly 13 percent of the ad’s occurrences. Ten percent went to ESPN2, eight percent to ESPN and seven percent to NBC. The team at Activision also made the decision to more often run the longer versions of “Become Legend.” While the first five days saw only 75 airings compared to the 100 behind “Launch Gameplay Trailer,” the actual air time was 30 percent more. Running longer versions – 60 to 90 seconds at a time – reveals just how much interest the brand had in immersing and engaging consumers with a theater-like viewing experience. Another revealing piece of the media plan was the decision to spend not only on more duration, but more audience. 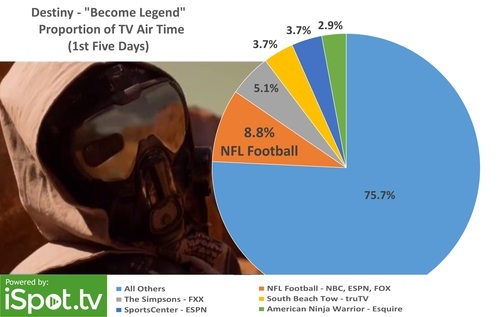 Prominent placements on ESPN, NBC and the primetime NFL week-one games meant far more eyeballs would be enjoying the theater of “Become Legend.” Even though the ad aired 25 percent fewer times in its first five days, iSpot.tv estimates that Activision spent at least four times as much for those fewer occurrences. Both the separate creative choices behind “Launch Gameplay Trailer” and “Become Legend,” and the disparate media plans illustrate how brands, advertising agencies and media buyers work separately toward the same strategic goal. In this case, it seems the goal was to assure and ignite a core gaming target and then engage and excite the broad gaming audience. The marriage between Activision, venerable videogame publisher, and Bungie, heralded Halo developer, promised big things for next-gen console consumers. In the companies’ first, record-breaking effort, it seems their Destiny was indeed inescapable.